Following a new and intense round of negotiations, the management and Works Council for the flight and cabin crew of Tyrolean Airways agreed last night on the cornerstones of a new Group collective wage agreement for the approximately 3,200 members of the flight staff. A framework agreement to this effect was already signed by the social partners. The Supervisory Board of Austrian Airlines also gave its stamp of approval to the proposal solution. The framework agreement serves as the basis for a new Group collective wage agreement which will be drafted in detail and already apply to the approximately 900 pilots and 2,300 flight attendants as of December 1, 2014. The agreement regulates future salaries and retirement benefits, working time and career development for the cockpit and cabin crew. The parties to the negotiations agreed not to disclose any details about the agreement. A key aspect of the negotiated solution is also the transfer of flight operations to Austrian Airlines effective March 1, 2015. In this connection special severance payments were agreed upon. “Due to the agreement we now have a new starting point for a new, unified Austrian Airlines – flown by Austrian, operated by Austrian. We can now concentrate on designing the future. This includes the modernization of the fleet“, Jaan Albrecht adds. Austrian Airlines employs a total staff of 6,300 employees. The fleet is comprised of 78 aircraft, which fly to about 130 destinations from its home airport in Vienna. Copyright Photo: SPA/AirlinersGallery.com. 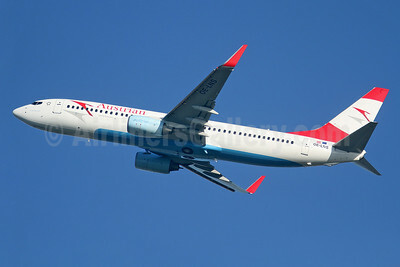 Austrian Airlines’ (operated by Tyrolean Airways) Boeing 737-6Z9 WL OE-LNM (msn 30138) arrives at London (Heathrow). This entry was posted in Austrian Airlines, Austrian Airlines Group, Tyrolean Airways and tagged 30138, 737, 737-600, 737-6Z9, Austrian Airlines, Boeing, Boeing 737, Boeing 737-600, Heathrow, LHR, London, OE-LNM, Tyrolean Airways on October 9, 2014 by Bruce Drum. 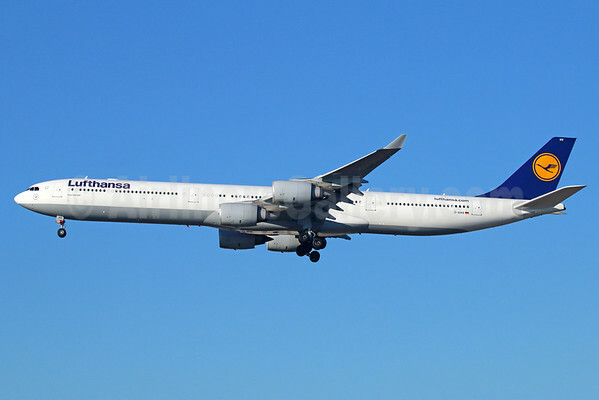 Deutsche Lufthansa AG (Lufthansa Group) (Lufthansa) (Frankfurt) achieved a further increase in its operating result for the first quarter of 2014, thanks to continued progress with its Score results-enhancement program. In what is traditionally the weakest quarter of the year, the company posted an operating result of EUR -245 million ($341 million), a EUR 114 million ($158.7 million) or 31.8% improvement on the same period last year. Adjusted for non-recurring items, such as the cost for the accelerated installation of new Lufthansa Business Class seats, which accounted for some EUR 55 million in this period alone, the first-quarter operating result was improved by EUR 105 million to EUR -190 million ($264.5 million). The improved quarterly operating result can be largely attributed to an increase in profits at Lufthansa Technik and the positive impact of the revised depreciation policy for aircraft and spare engines which was adopted at the beginning of the year. In addition, the Lufthansa Group also improved its cost structures in the passenger segment. Adjusted to eliminate fuel-price and currency factors, first-quarter unit costs for the passenger business segment were a 3.7% improvement on their prior-year level. The Group has set itself the goal of reducing such costs by 4% for 2014 as a whole by implementing various Score-related actions. Total revenue for the quarter amounted to EUR 6.5 billion, a 2.5% decline on the prior-year period. Lower traffic revenues were generated for the period, not least as a result of adverse currency movements. The revenue result was achieved with a 1.2% reduction in total flights operated, owing mainly to fleet modernizations and the use of larger aircraft. The net result for the period amounted to EUR -252 million, a substantial EUR 206 million or 45.0% improvement on the first quarter of 2013. The Lufthansa Group has further confirmed its previous expectation of posting an operating profit of between EUR 1.3 and 1.5 billion for 2014 as a whole. The Group also remains confident of reporting a 2014 operating result adjusted for non-recurring items of between EUR 1.7 and 1.9 billion. The projections remain unchanged despite the Verdi strikes at German airports in March and the three-day strike at Lufthansa, Germanwings and Lufthansa Cargo by the Vereinigung Cockpit pilots’ union in April, which reduced Group earnings by over EUR 70 million. “Our advance passenger bookings saw sizeable declines during the Vereinigung Cockpit pilots’ strike,” Menne continues. “And, with the competition we face on our European network and the strong pricing pressures on our North American routes, we haven’t yet been able to raise them again. So, despite the currently tense market environment, we are doing our utmost to recoup these earnings losses in our ongoing business.” Some assistance should be provided here by the fall in fuel prices: full-year estimates for this cost item are now lower following the first-quarter results than they were in March. The Group’s Passenger Airlines business segment reported an operating result for the quarter of EUR -332 million, a EUR 31 million improvement on the same period last year. The progress here was partially due to the revised Group depreciation policy, whose lower costs added EUR 86 million to the quarterly result. At the same time, the decline in revenue per available seat-kilometre was offset by cost economies, which were reflected in a clear reduction in cost per available seat-kilometre. Among the Group’s member airlines, Lufthansa and Germanwings posted a quarterly operating result of EUR -286 million (a EUR 6 million year-on-year improvement), Swiss International Air Lines (Zurich) achieved an operating profit of EUR 6 million (up EUR 22 million) and Austrian Airlines (Vienna) posted an operating result of EUR -54 million (a EUR 2 million improvement on the prior-year period). Lufthansa Technik made the most positive contribution to the Lufthansa Group’s first-quarter results, with an operating profit for the period of EUR 97 million, a EUR 16 million improvement on January-to-March 2013. The Group’s IT Services segment raised its first-quarter operating result by EUR 2 million to EUR 5 million. LSG SkyChefs reported a first-quarter operating result of EUR -4 million, a EUR 7 million year-on-year decline which was in part attributable to adverse currency movements. And with rigorous cost discipline in a still-tough market environment, Lufthansa Cargo achieved a solid operating profit of EUR 21 million, which compares to EUR 28 million for the prior-year period. Total revenue for the first three months of 2014 amounted to EUR 6.5 billion, a 2.5% decline on the same period last year. Total operating income also declined 2.5%, to EUR 7.0 billion. At the same time, total first-quarter operating expenditure was reduced 6.0% to EUR 7.2 billion. Fuel costs for the quarter declined by EUR 157 million or 9.4% to EUR 1.5 billion. The figure includes a EUR 20 million loss from fuel price hedging activities. Fees and charges were 0.8% below their prior-year level, owing in particular to the lower flight volumes. The Lufthansa Group achieved an operating result of EUR -245 million for the first quarter of 2014, a period that is traditionally the weakest of the year. The net result for the quarter amounted to EUR -252 million, a substantial EUR 206 million improvement on the first three months of 2013. First-quarter earnings per share rose from the EUR -1.00 of 2013 to EUR -0.55. The Lufthansa Group increased its investments in modernizing and maintaining its aircraft fleet to EUR 755 million in the first-quarter period. All in all, the Group invested EUR 859 million, some EUR 141 million more than in the same period last year. Cash flow from operating activities totalled EUR 855 million, while free cash flow (operating cash flow less net capital expenditure) amounted to EUR 195 million. Net debt stood at EUR 1.6 billion, down EUR 61 million year-on-year. The balance sheet equity ratio as calculated in accordance with the new IAS 19 capitalization principles amounted to 17.9%, up 2.5 percentage points from the first quarter of 2013. Top Copyright Photo: Michael B. Ing/AirlinersGallery.com. Airbus A340-642X D-AIHV (msn 897) of Lufthansa completes its final approach to the runway at Los Angeles International Airport (LAX). Bottom Copyright Photo: Paul Bannwarth/AirlinersGallery.com. 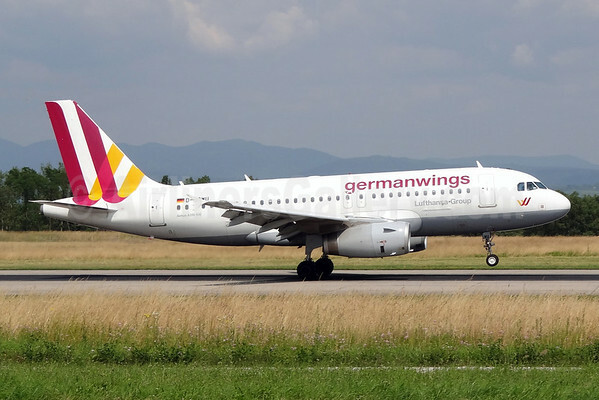 The Lufthansa Group continues to shift more non-hub European flying to the lower-cost Germanwings. Airbus A319-132 D-AGWU (msn 5457) lands at EuroAirport. This entry was posted in Austrian Airlines, Austrian Airlines Group, Germanwings (2nd), Lufthansa, Lufthansa Group, Swiss International Air Lines and tagged 5457, 897, A319, A319-100, A319-132, A340, A340-600, A340-642X, Airbus, Airbus A319, Airbus A319-100, Airbus A340, Airbus A340-600, Austrian Airlines, Basel, Basel/Mulhouse, Basel/Mulhouse/Freiburg, BSL, D-AGWU, D-AIHV, EuroAirport, Germanwings, Germanwings (2nd), LAX, Los Angeles, Lufthansa, Lufthansa Group, Swiss International Air Lines on May 6, 2014 by Bruce Drum. Lufthansa Group (Frankfurt) in 2012 orchestrated the transfer of around 2,000 staff members of its Austrian Airlines (Vienna) subsidiary to the cheaper Tyrolean Airways (Innsbruck) subsidiary to reduce overall costs. A Vienna court ruled yesterday (September 2) that the move was illegal and the employees were still employed by Austrian Airlines. 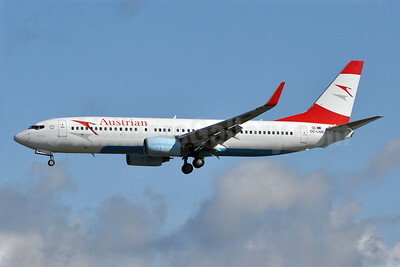 Austrian Airlines stated it would appeal the verdict of the Vienna Labor and Social Affairs Court. The transfer was the heart of the loss-making airline’s restructuring plan and its attempt to return to profitability along with the Lufthansa Group. Currently Tyrolean Airways is operating all Austrian Airlines-branded aircraft (except one Boeing 777) as Austrian Airlines flights. The one Triple Seven is keeping the Austrian Airlines AOC alive. Copyright Photo: Austrian Airlines-branded Boeing 777-2Z9 ER OE-LPA (msn 28698) pictured departing from Tokyo (Narita) is actually being operated Tyrolean Airways-employed crews on the Tyrolean AOC until the Vienna court deemed the crews to be considered Austrian Airlines employees again! What will now happen to the Tyrolean crews who were operating alongside Austrian crews? This entry was posted in Austrian Airlines, Austrian Airlines Group, Lufthansa, Lufthansa Group, Tyrolean Airways and tagged 28698, 777, 777-200, 777-2Z9, Austrian Airlines, Boeing, Boeing 777, Boeing 777-200, Lufthansa, Lufthansa Group, Narita, NRT, OE-LPA, Tokyo, Tyrolean Airways, vienna court on September 3, 2013 by Bruce Drum. At its meeting yesterday, the Supervisory Board of Lufthansa approved the Austrian Airlines Group the lease of an additional Boeing 777-200 ER amounting to about EUR 33 million. Austrian Airlines Group will lease the aircraft for a period of about eight years from an internationally renowned leasing company. 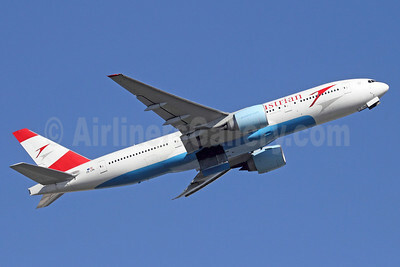 The aircraft will be transferred to Austrian Airlines Group in spring next year. Before it is put into operation, it will be subject to a maintenance check in Vienna and equipped with the new long-haul cabin including the new modern Economy seats, the new in-flight entertainment system and the new Business Class seats which can be converted into completely flat beds. The new Boeing 777 is scheduled to take off on its first flight in the summer of 2014. At present the long-haul fleet of Austrian Airlines Group consists of ten wide-bodied aircraft, of which four are Boeing 777-200 aircraft and six are Boeing 767-300s. 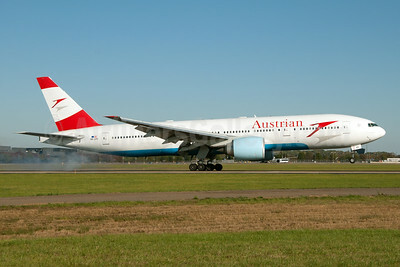 On the basis of the new Boeing 777, the Austrian Airlines Group long-haul fleet will be expanded to eleven aircraft. The most recent expansion of the long-haul fleet took place in 2007 when one Boeing 777 with the registration OE-LPD was added. The Boeing 777 is the world’s largest twinjet and has a capacity of over 300 passengers. After passing its test flight and subsequently receiving approval from the authorities, the last Boeing 777 to feature the all-new cabin, aircraft with the registration OE-LPB has been put into revenue service. This means the conversion of the Austrian Boeing 777 fleet is now complete. A total of 1,232 new seats have been fitted in the four Boeing 777 aircraft to have been converted, 192 in Business Class and 1,040 in Economy Class. The new cabin on the Boeing 777 offers space for a total of 308 passengers. Sophisticated seat distribution allows four out of every five Business Class passengers direct access to the aisle. The national carrier has now converted its entire Boeing 777 fleet, and two of its Boeing 767 aircraft. Some 1.1 million customers fly long-haul with Austrian Airlines every year, on 5,500 flights. The Austrian Airlines Group continued to make progress in its restructuring program, as shown by its financial performance indicators, in spite of a difficult first quarter related to the winter season. In spite of massive cost burdens to the amount of EUR seven million related to the airline ticket tax and fuel price increases, the country’s largest domestic airline succeeded in improving its operating result by EUR 11 million, or 16.4 percent from the prior-year quarter. Accordingly, Austrian Airlines posted an operating loss of minus EUR 56 million in the first quarter of 2013 (Q1 2012: minus EUR 67 million). “Austrian Airlines had a tough opponent in the likes of Jack Frost. Winter-related flight cancellations and expensive de-icing unnecessarily burdened our efforts to get back into the black”, says Chief Executive Officer Jaan Albrecht. “We are in a substantially better position than in the previous year, though our performance is slightly below our expectations. Nevertheless, I am optimistic that we will already achieve a turnaround this year”, he adds. Total operating revenues declined slightly in the first quarter of 2013, down 1.3 percent to EUR 458 million (Q1 2012: EUR 464 million). Operating expenditures also fell by 3.2 percent, from EUR 531 million to EUR 514 million, an indication that the cost reduction measures have begun to take hold. On balance, the airline posted an operating loss of minus EUR 56 million in the first three months of the year. There were no one-off effects in the first quarter. The number of passengers carried by the Austrian Airlines Group decreased by 2.7 percent to approximately 2.3 million in the period January to March 2013, which can be attributed to the streamlined fleet. As a consequence of optimized fine-tuning, capacity utilization (= passenger load factor) improved by 3.3 percentage points to 74 percent. The number of people employed by the Austrian Airlines Group totaled 6,265 employees as at the quarterly balance sheet date of March 31, 2013 (December 31, 2012: 6,236 employees). In 2012/13, about 150 people were hired for positions as flight attendants, ground crew and pilots. Austrian Airlines launched a comprehensive restructuring program at the beginning of 2012 designed to enhance the airline’s competitiveness and profitability. The focal point of the initiative was the successful transfer of flight operations to its subsidiary Tyrolean Airways effective July 1, 2012. This step served to bundle flight operations, which in turn enabled the elimination of redundancies in flight administration. A corresponding program is currently being implemented in 2013. The harmonization of the fleet for European flights was successfully concluded at the end of March. Eleven Boeing 737 aircraft were taken out of flight operations, whereas seven Airbus 320 aircraft were added to the fleet. In October 2012, Austrian Airlines also launched a product campaign on its long-haul flights. All Boeing 767 and 777 aircrafts will be equipped with new, modern cabins, new Economy Class seats, new horizontal full-flat Business Class seats and a new in-flight entertainment system by September 2013. Five aircraft have already been remodeled. Investments related to the redesigning of the interiors of all the aircraft will amount to more than EUR 90 million. 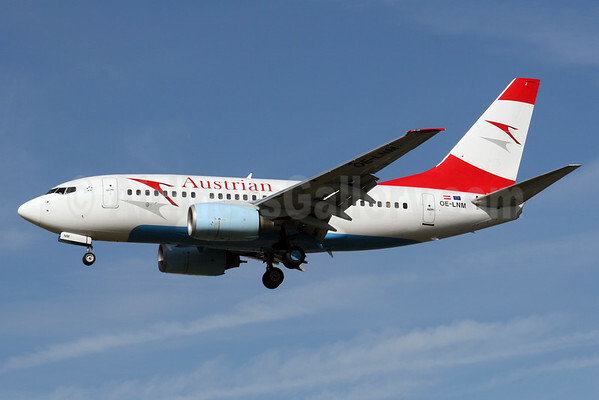 Moreover, as of May 17, 2013, Austrian Airlines has added the Chicago route to its destinations. As a result, the number of flight connections to North America has been increased to 26. The forecast for bookings to Chicago show capacity utilization of over 80 percent. Copyright Photo: Stephen Tornblom. Boeing 777-2Z9 ER OE-LPC (msn 29313) lands at New York (JFK). This entry was posted in Austrian Airlines, Austrian Airlines Group and tagged 29313, 777, 777200, 7772Z9, Austrian Airlines, aviation, Boeing, Boeing 777, Boeing 777-200, Boeing 777200, business class seats, JFK, New York, OELPC, transportation on May 8, 2013 by Bruce Drum. Austrian Airlines Group has initiated a further step in the restructuring program announced in spring. This step will eliminate redundancies in its organization. These were identified through the conducting during the second half of 2012 of analyses of the operating procedures employed in the flight operations of Tyrolean Airways, in technical processes and in administrative departments. The result is potential savings somewhat greater than €10 million. 150 administrative positions out of the Group’s 6,320 employees will be cut. Flight control operations are currently managed from two centers. These operations will all be handled by the Vienna hub. The headquarters of all flight administration operations will be set up in Innsbruck. This essentially involves the establishment of a Shared Services Center in the city, to which nine departments will be assigned. The planning of personnel, resources and rotation will be concentrated in Innsbruck. Redundant operations will also be eliminated at Austrian Airlines. The “Part M” responsibilities forming part of technical maintenance – with these including the engineering, the planning and the management – will be grouped in Tyrolean. Tyrolean is the holder of the official AOC (Air Operator Certificate). The technical maintenance of the fleets will continue to be undertaken at a variety of stations. Innsbruck will handle the maintenance of the Bombardier Dash 8 aircraft; Vienna, of the Fokker, Airbus, and Boeing airplanes, and Bratislava, the overhauling of the Fokker fleet. All measures will be implemented in 2013. The grouping of operations at a set of centers will result in a reduction of up to 150 jobs. These will be in Austrian Airlines’ administrative operations. The Austrian Airlines Group has resolved to set up a social plan for the employees affected. Details of it are still being worked out with the works council. Copyright Photo: Keith Burton. Boeing 737-8Z9 OE-LNS (msn 34262) departing London (Heathrow) now carries “Operated by Tyrolean” sub-titles. This entry was posted in Austrian Airlines, Austrian Airlines Group, Tyrolean Airways and tagged 34262, 737, 737800, 7378Z9, Austrian Airlines, aviation, Boeing, Boeing 737, Boeing 737800, Heathrow, LHR, London, OELNS, transportation, Tyrolean Airways on December 30, 2012 by Bruce Drum. 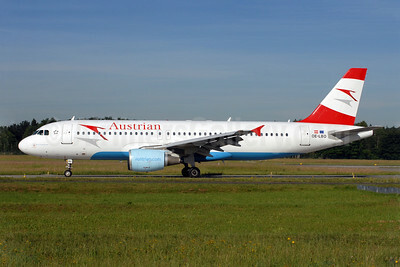 Austrian Airlines (Vienna) is planning to acquire seven additional Airbus A320s in order to replace its remaining Boeing 737s by the summer of 2013. Austrian currently operates seven Boeing 737-800s. This entry was posted in Austrian Airlines, Austrian Airlines Group and tagged 33833, 737, 737800, 7378Z9, Airbus, Austrian Airlines, aviation, Boeing, Boeing 737, Boeing 737800, boeing 737s, FRA, Frankfurt, OELNR, transportation on July 14, 2012 by Bruce Drum.